Astronomer Enterprise allows you to provide 'Airflow as a Service' to your organization. Deploy to your Kubernetes cluster in under an hour, and start running production DAGs right away. Give your DevOps a head-start with our years of experience configuring Airflow in a production environment. All data stays in your environment - in your cloud. The Astronomer platform is completely self contained. Astronomer Enterprise is made for open-source software developers using open-source components. Take advantage of our rich CLI and API. Astronomer Enterprise makes it easy to deploy pre-configured containers to Kubernetes. Plus, we give you a CLI to deploy DAGs through a private Docker registry that interacts with the Kubernetes API. Astronomer caters to the needs and desires of modern open-source developers with a fully Dockerized setup, a rich CLI, GraphQL API, and access to everything under the hood. Run separate environments with separate users and integrate your own SSO through auth0. Provision, scale, and deprovision isolated Airflow environments in minutes. Integrated monitoring stack built on Prometheus and Grafana. Built on industry standard open source components to make it easy to integrate into your other systems. Leverage our years of experience running Apache Airflow internally and with our customers across industries to conquer any issue at any scale you may encounter. We built out pre-configured Docker containers with Celery as well as a group of complementary tools for metrics and monitoring. 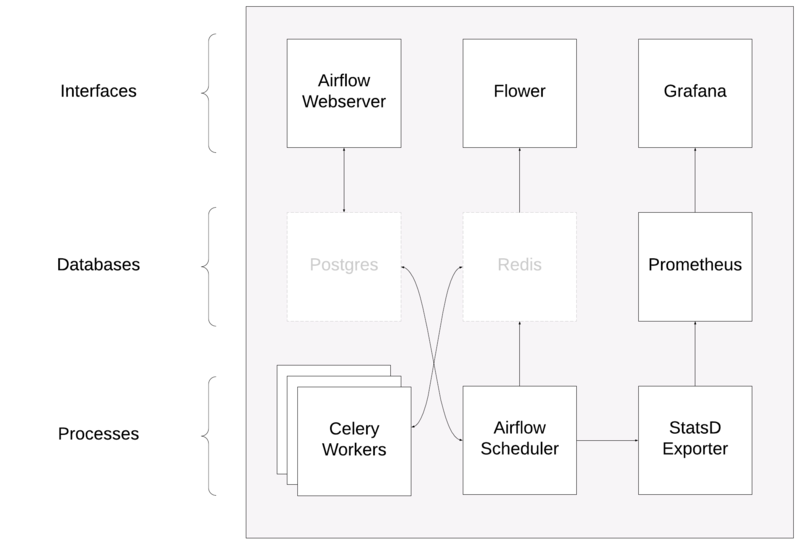 The Astronomer Airflow module consists of seven components, and all you have to do is bring your own Postgres and Redis database. Everything you need to know about installing Astronomer Enterprise. Fill out this form and we'll get you started on a trial. Do you currently use Kubernetes?